PPS: Planning a Privatization Scheme? Around here, the acronym PPS usually means “Pittsburgh Public Schools,” but now it might mean “Planning a Privatization Scheme.” The district has hired two consulting companies to help it craft an education plan that addresses equity issues for students and its looming financial crisis. But it turns out those two companies – Bellwether and FSG – support privatization of public schools. Hello? Who invited them to the party? But concerns with the teacher evaluation system aside, the Pittsburgh school board voted to approve the contract with FSG (with Bellwether as a subcontractor) without asking a single question about the philosophy of these two companies. Only board members Mr. Mark Brentley and Dr. Regina Holley voted “no” after inquiring if there weren’t local organizations that could do this consulting work, keeping all those dollars in the regional economy (an important point). But what’s worse than sending those dollars out of state, is that we will be spending $2.4 million on a plan formulated by people who actually believe we ought to be handing our public schools over to private companies. These are the people who founded Bellwether. They were management consultants and investors (Ms. Wells herself worked at Bain & Company) and they have MBAs, not education credentials. Bellwether’s own client list reads like a who’s-who of charter schools and corporate reformers. So I’m not particularly inclined to take their word for it when they tell us that they are “agnostic” as to whether charter schools are the path of Pittsburgh’s future. Last week the district asked me to meet with Mr. Bernatek to share my vision for the future of Pittsburgh’s public schools. I talked about the things our grassroots movement has been fighting for: art, music, library, science, history, and languages for all our students. Our teachers back in the classroom and smaller class sizes. A restoration of our tutoring programs, nurses and social workers in every school, parent engagement specialists, and community-based wrap-around services that address poverty and whole neighborhood needs. I want to see our district and our school board take a public stand and boldly insist that state legislators deliver adequate, equitable, and sustainable funding for all our students. And I want them to start talking about public education as a public good that must be cherished and promoted. Does all this mean Bernatek and his team will recommend more testing, charterizing our public schools, or blended cyber-learning as the answer to Pittsburgh’s challenges? I don’t know. But I do know that the district and school board ought to have asked a lot more questions before hiring these two companies. This information is all available on the web (many thanks to Yinzercator Pam Harbin for the internet sleuthing for this story). Which leads me to suspect that the district knew full well just who they were dealing with. And that raises a lot more questions. Is PPS really Planning a Privatization Scheme? So there we were at the White House. 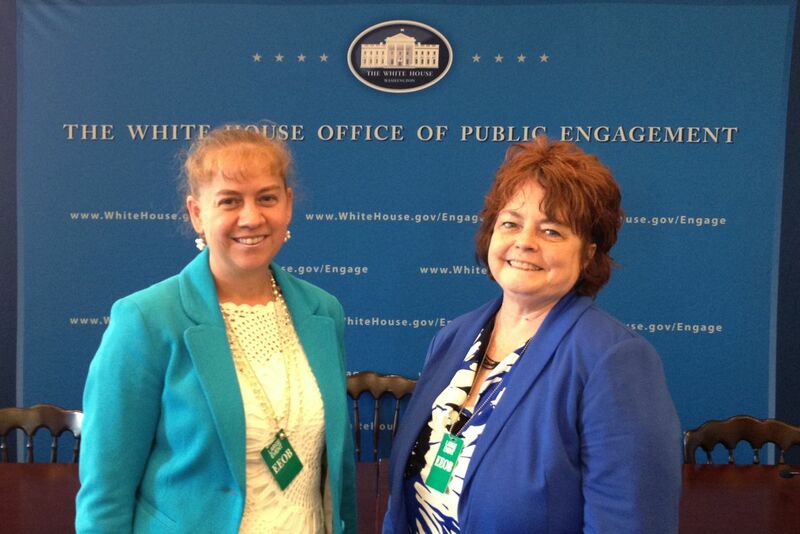 Forty “education leaders” from Pennsylvania invited to meet with President Obama’s senior policy advisors as well as top staff at the U.S. Department of Education (USDE). The room contained district superintendents, school board members, principals, college presidents, education professors, representatives from a host of education associations, a super-PAC school privatizer, educational consultants, and various non-profit directors. And one elephant. This elephant in the room fittingly started as a Republican beast, but has gained so much traction with Democrats over the past decade that it could just as well have been a donkey lurking there in the corner. Whatever its animal form, No Child Left Behind (NCLB) was casting a pretty big shadow and it was time to talk about the consequences of labeling our public schools as failures, high stakes testing, and the demonization of teachers. And so during the first discussion session, I stood to address Roberto Rodriguez, the President’s senior policy advisor on education. I reminded him of what I had told him back in March, when I implored the White House to stop participating in the national narrative of failing public schools. (See “What I Told the White House.”) And then I gave him the view from the ground here in Pennsylvania where our grassroots movement has been fighting massive budget cuts, to let him know what it looks like when our country stops believing that public education is a public good. When it chooses to cut teachers, tutoring programs, nurses, special ed, school buses, music, art, foreign languages, and even Kindergarten. NCLB has created a culture of punishment and fear, with student “achievement” measured by highly problematic standardized tests that don’t begin to assess real learning, and teachers evaluated on those test scores and little else. It has narrowed the focus in our schools to reading and math, jettisoned real education in favor of high stakes testing resulting in a plague of cheating scandals, and nurtured a system of “teaching to the test” on top of weeks of school time spent on test taking and nothing else. NCLB set a pie in the sky target of 100% proficiency for all U.S. students by 2014, and as that deadline has approached and the proficiency bar has moved ever higher, more schools have “failed” and more teachers have been blamed. All this supposed failure and blaming has served as convenient cover to gut public education in states like Pennsylvania, where Governor Corbett and the Republican controlled legislature acted as fast as they could to slash $1 billion from public schools, install voucher-like tax credit programs, and privatize struggling districts, handing their schools over to corporations run by their largest campaign donors. But they had plenty of help from the other side of the aisle, because faced with the relentless media barrage of the failing-narrative, far too many people have lost confidence in public education as a pillar of our democracy. And this has been happening all across the United States, with the backing of mountains of ultra-right superPAC money and ALEC-inspired legislation as well as major new foundation players including the Bill and Melinda Gates Foundation and the Broad Foundation. This is truly a national battle, and we can’t win this fight isolated in our trenches. We need tone-changing leadership from the top. My report from the grassroots met with a rousing round of applause from attendees and was followed by a series of equally urgent remarks. Larry Feinberg of the Keystone State Education Coalition warned that President Obama’s policies have looked nearly identical to Republicans on education (with the exception of vouchers, which he does not support) and that he may backfire at the polls with teachers and educators. Feinberg sits on the Haverford school board, a wealthy district near Philadelphia, and reminded the President’s staff that middle-class students in well-resourced schools actually score at the top on international tests. We are ignoring poverty while adding ever more testing, which will drastically expand yet again this year in his district and many others. Similarly, Susan Gobreski of Education Voters PA argued that we ought to have a new national narrative of equity, and that we have choices and need to help the public see that we can make different ones. For their part, the White House advisors and senior USDE staff seemed to agree. Roberto Rodriguez emphasized that we “need more investment in public education, not less” with a focus on early childhood education, curriculum, wrap around programs, and parent engagement. He reported on the 300,000 teaching jobs lost in recent years, noting the economic implications for the U.S. and warned that sequestration – which will happen if congress does not head off looming mandatory budget cuts this fall – will mean billions of dollars cut to Title I, special ed, higher ed, and other student programs. Delisle also commented on the polarizing effect that NCLB has had on our nation. It has created a climate in which those who embrace the corporate-marketplace-inspired reform mantra of choice, competition, and test-based accountability smear professional educators and public school advocates as “defenders of the status quo” who only care about union perks and not children. But this educational “reform” movement of the past decade has been a bit like the king’s new clothes. A wide swath of America has lined the parade route – Republican and Democrat alike – loudly cheering for the king’s beautiful new royal robes of privatization, but there’s nothing there covering his privates. This “reform” movement is premised on a false idea that American schools have been in steady decline for the past forty years, which is not supported by the evidence. Despite ample data to the contrary, these reformers continue to insist that our students are falling further and further behind their international peers and promote the NCLB inspired narrative of failing public education. (For an excellent analysis of the data, see Diane Ravitch, The Death and Life of the Great American School System.) What’s more, they accuse those who point out the obvious – that privatization is not working, that charter schools and tax credits are draining our public coffers of desperately needed resources, that we have to address the astonishing high rate of child poverty – of being satisfied with the persistent racial achievement gap and using poverty as an excuse. We are at a cross-roads with public education in our country. If we are going to get serious about making sure that every student has the opportunity to attend a great public school – “A school,” as Assistant Secretary Deborah Delisle said, “that every one of us would send our child to” – then we have to get serious about restoring this country’s belief in the public good of public education. It’s time to name the elephant in the room, have a serious conversation about overhauling NCLB, and make the choice to adequately and equitably fund our public schools. Choice. They stole our word. Not so long ago, “choice” belonged to progressives who had successfully attached its meaning to women’s reproductive rights. It had become shorthand for an entire, complex movement (though often stood in for the single hot-button issue of abortion). But the agents of school-privatization have co-opted the term. “School choice” now means sending public taxpayer dollars to private and parochial schools benefiting a select few at the expense, and to the detriment, of the great many. We are a nation of consumers, trained from an early age to look at everything as a consumer choice. And we like the idea of choice: what’s more American than a grocery store aisle with 112 kinds of cereal to choose from? In fact, the concept of choice is almost a pathological fixation in our culture. If we can choose something, then we will like it; if we have a choice, then all is well. Take healthcare as an example, where the far right has been launching a successful attack on affordable medical care for all, with scary stories about people losing their “choice of doctors” or “choice of plans.” When it comes right down to it, what people want is not necessarily a choice of plans or doctors, but a good doctor in their community that they can afford to see. The good news is that the House is not going along with Governor Corbett’s proposal to cut another $100 million in block grants to public schools for early childhood education. This is money that Pennsylvania schools could not afford to lose on top of last year’s massive cuts. However, the preservation of these funds comes with strings attached – and we’ll see those strings today as legislators vote to further expand voucher programs. We will undoubtedly hear how tax breaks for corporations and the funneling of public money to private and parochial schools is wonderful, and how these programs create “choice” and “competition.” Just remember that other C word. No not that one. Remember “community.” As Diane Ravitch said, we have a communal responsibility to public education. Once we start seeing it as a consumer choice, we will lose the essence of our public schools: that they belong to all of us, and that we share the obligation to support them.